Find out what kind of issues the iWorm virus causes to an infected Mac and get an effective up-to-date walkthrough to get rid of this infection for good. First and foremost, iWorm is a type of Mac malware that transforms the infected machines into bots. Figuratively speaking, a contaminated Mac becomes a dumb soldier in a big army of suchlike cyber creatures. The botnet operators can engage these “troops” in large-scale distributed denial of service attacks as well as assaults aimed at brute-forcing other users’ passwords. Of course nobody is willing to become criminals’ accomplice, but the iWorm trojan doesn’t ask for consent when deploying its despicable operations. This pest’s common entry point involves a legit-looking product, such as Adobe Photoshop, Java, or Microsoft Office. Some Mac application repositories online, including The PirateBay, contain virus-tainted installers for these generally trustworthy suites. The setup process in such scenarios promotes extra artifacts that are surreptitiously bundled with the kernel apps. This explains how a great many users fall victim to the baddie in question with no red flags being raised. After the modified installer has dropped iWorm onto the Mac, the victim will see a dialog box that requests their admin password so that the setup can be completed. As soon as the password is typed in, things start getting out of hand. The trojan drops the com.JavaW.plist file, which configures the host system to run a malicious executable at startup time. Said process then establishes connection with one of the malware’s Command and Control servers. This way, the threat actors can remotely trigger arbitrary commands on the target Mac box. The users may not be aware of this happening. Somewhat higher CPU consumption than usual might be the only giveaway, but people tend to overlook this effect and move on with their day. The context of iWorm’s activity has evolved over time. A recent cybercrime model using this infection has to do with another sample of Mac malware called MacDownloader. Analysts are convinced that the latter is run by Iranian hackers. The cybercrime ring behind it has been trying to compromise defense contractors based in the United States. The workflow of the MacDownloader attack involves a spear-phishing page camouflaged as a resource for personnel training. A video on that site appears to be broken and can only be viewed after the visitor updates their Adobe Flash Player to the latest version. The updater, however, installs the malware instead of doing what it’s supposed to. 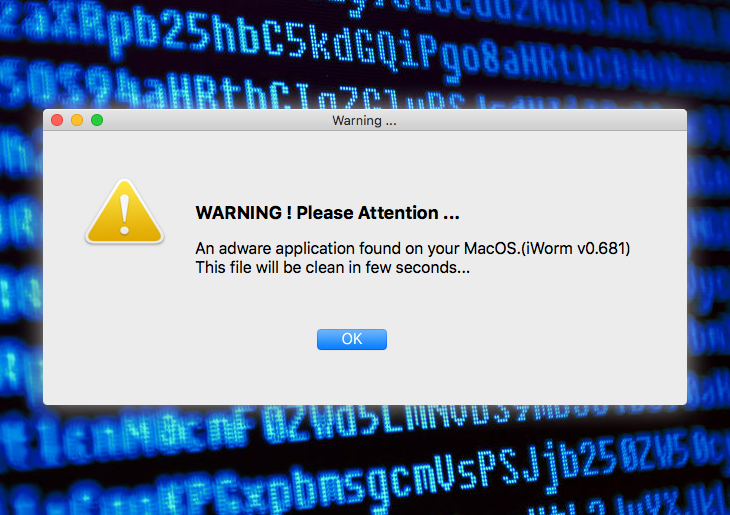 Then, the MacDownloader virus displays a fake warning that reports an adware application found on the Mac. The name of this rogue threat is iWorm v0.681, where the version number may vary. To get rid of the purported infection, the user is instructed to hand over their admin password. The ultimate goal of the attack is to collect confidential data from plagued Mac workstations. So it turns out that the malefactors may also exploit the notoriety of iWorm to scare people into providing their sensitive credentials. No matter whether you are dealing with the genuine virus or a rogue security app that wrongfully reports it, it’s strongly recommended to get rid of the troublemaking code immediately. When confronted with malicious code like the iWorm virus on Mac, you can neutralize its toxic impact by leveraging a specially crafted system utility. The Freshmac application (read review) is a perfect match for this purpose as it delivers essential security features along with must-have modules for Mac optimization. This tool cleans unneeded applications and persistent malware in one click. It also protects your privacy by eliminating tracking cookies, frees up disk space, and manages startup apps to decrease boot time. On top of that, it boasts 24/7 tech support. The following steps will walk you through automatic removal of the iWorm infection. 4. Check whether the iWorm virus has been fixed. If the lock screen is still there, go to the Uninstaller option on Freshmac GUI. Locate an entry that appears suspicious, select it and click Fix Safely button to force-uninstall the unwanted application. 5. Go to Temp and Startup Apps panes on the interface and have all redundant or suspicious items eliminated as well. The iWorm fraud shouldn’t be causing any further trouble.